I hope you don’t mind, but before I get to the food portion of this post I’d like to share with you something very exciting that happened to me yesterday. After 10 years of flying in a small, single-engine plane as my husband’s unofficial co-pilot (assisting with the charts/GPS, watching for other traffic and taking the yoke occasionally), I finally flew from the Captain’s seat (left side)! Of course, I was with an instructor but I can’t begin to tell you the thrill I felt to be airborne and to start something I’ve wanted to do since I was 18 years old. Thanks to my husband for lighting a fire under my bum to get the licensing process rolling by hiring an instructor for me. Equipped with my headset, we headed to the airport for my flying session. I must admit that I was both excited and nervous on the way. Never mind that I have almost 1000 hours as a passenger in a small Cessna; the idea that the upcoming session would require some responsibility on my part was daunting. I hoped to simply fly with the instructor and observe, but he had other ideas. I did so much more than I imagined. I learned to taxi the plane and guess what, this was not easy. Instead of following the straight yellow lines leading to the runway, I looked like I was following a switchback trail! Left and right, left and right. I kept wanting to use the yoke (pictured above) to direct the plane when I should have been using the rudder pedals! Jeff, my instructor, finally told me to put my hands on my lap so I’d be forced to use my feet to control the direction of the plane. Thankfully, this began to make sense after a while. Next, takeoff! I actually got the plane off the ground myself! How completely exhilarating! The sensation is markedly different sitting as a passenger versus pulling the yoke yourself. Once airborne, Jeff, handled the radio communication with air traffic control and guided me in monitoring the panel, but I flew the plane to our destination (another airport). At 3.500-ft altitude I practiced turns, ascents, descents and airport approaches. We did three takeoffs and landings throughout the 2-hour session, enough time to feel sufficiently overwhelmed by all I had to learn. When we returned, my ever thoughtful husband had a pilot log book waiting for me so that my instructor could record my first flight hours. I beamed from ear-to-ear for the rest of the day. Well, I still am. I’m very grateful to see a dream begin to materialize after 20 years. Now for even more good stuff. 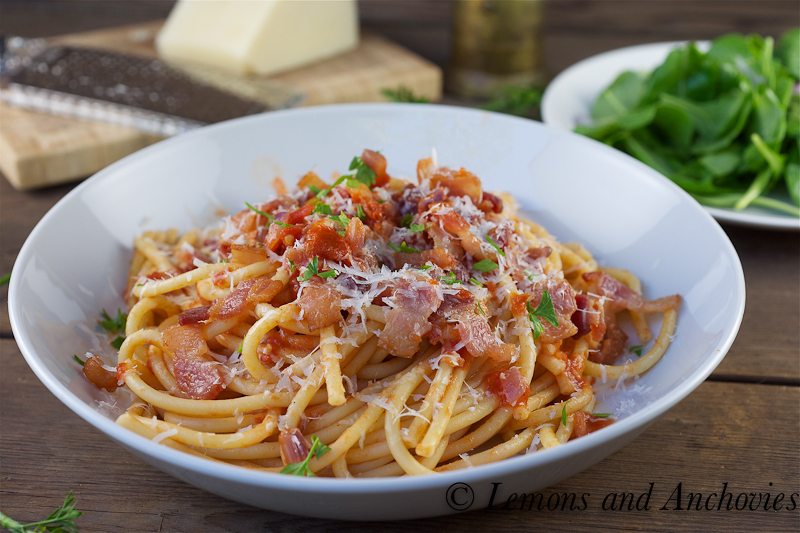 I made one of my favorite pasta dishes, Bucatini All’Amatriciana. It’s a popular tomato-based sauce that’s named after the town of Amatrice (central Italy). The dish is a study of gastronomic balance. The sweet tomatoes, spicy chili flakes, sharp/salty pecorino cheese and the full-flavored guanciale make eating this a truly satisfying experience. In Rome last year, I ate this and spaghetti carbonara with abandon. Cholesterol be, uh, darned. Guanciale (guan-cha-leh) is a type of Italian bacon made from pork jowls (cheeks) and, in my opinion, is the star of this dish. Without it, you would essentially be enjoying an arrabiata sauce. Guanciale is a fatty piece of meat and imparts a wonderful porky goodness to a dish like this (and the carbonara I mentioned earlier). Pork cheeks are seasoned (but not smoked) and hung to cure for a few weeks. I’ve often fantasized about making my own guanciale at home (yes, I do fantasize about pork) but I’m not sure that I’d be able to pull it off. Has anyone ever tried? Typically, I get my guanciale from a local specialty store but between riding my bike, running errands and baking two desserts for a family barbecue tomorrow (Saturday), I didn’t have the time to make a special trip for just one item, as much as I would have liked to. Instead, you’ll notice that I used bacon in place of guanciale. If you have access to the latter, I would highly recommend you give it a try. If not, our bacon is a decent substitute. Pancetta would be better; alas, I didn’t have any of that either. As for the rest of the ingredients, bucatini seems to be the pasta of choice (Pictured below. See the hollow center?) and it’s something I always try to keep in stock. Your local Safeway might not have it but a specialty store like A.G. Ferrari should. Otherwise, thick spaghetti will work just fine. The rest of the ingredients, onion, canned Italian tomatoes (or sweet fresh tomatoes) and pecorino cheese are easier to come by. 1. Bring a pot of salted water to a boil. 2. 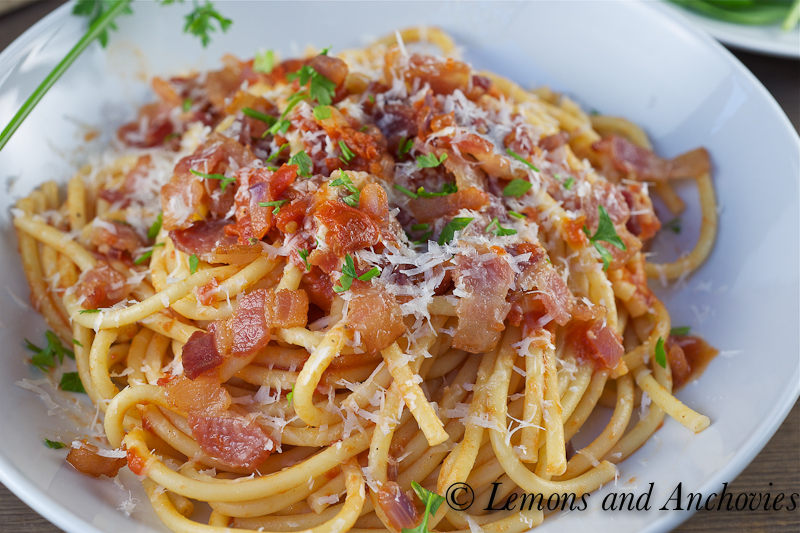 In a saucepan large enough to accommodate the cooked pasta, add 1 tbsp of olive oil and cook the bacon over medium heat. You want to cook the meat to render the fat but you don’t want it to be too crisp, so it’s best to watch it carefully. It took about eight minutes for me. 3. When the bacon is done, remove it from the pan and set aside. At this point, you can remove some of the fat that has rendered and leave enough to cook the onions. The fat is key to adding flavor to the sauce. I suggest that you remove 2/3 of it to start and set it aside so you can add more later if find your sauce lacks flavor. Cook the onions and chili flakes over medium heat in the remaining fat until they are translucent, about five minutes. 4. Take the whole, peeled tomatoes from the can and crush each one by hand as you add to the pan. Pour in the juice, as well. Bring this to a boil and simmer to allow the tomato flavor to concentrate a bit. The sauce will reduce a little. A few minutes into the simmer time I add the pasta to the boiling water. I like to time it so that the pasta cooks just as the sauce finishes simmering, which takes about 15 minutes, so I add the pasta at around the 7 minute mark. You can also add the bacon back to the pan at this point. Season with salt and pepper to taste but be mindful that if you use pecorino, this will add additional saltiness to the dish. 5. When the pasta’s ready, drain it and add to the sauce. Toss to coat the pasta well. Plate and sprinkle with pecorino cheese. Congratulations! How exciting. I’m terrified of heights, and I always get a bit queasy when I fly, so I greatly admire your skill and courage! And what a delicious plate of pasta to end your post. Yum! Sara, you’re way ahead of me! 🙂 I flew a small plane, too, a Cessna 172. I am SO excited for you!!! Congratulations! I have a couple of take offs under my belt, but never got the landing down, I got “My airplane” from my husband a couple of times and that was it. Can’t wait to hear about your first solo! What airports are you flying out of? We did Nut Tree in Vacaville and up to Grass Valley a few times. I can’t wait to hear about more of your lessons!!! I’m in awe that you actually flew a plane! And yes, the bucatini pasta dish looks very enticing too. In fact, it’s made me very hungry! And also, thanks for this awesome recipe, my boyfriend and I are obsessed with carbonara and this is a nice change of pace but still the same sort of concept. I also have been looking for guanciale but I have yet to find it. 😛 I think I need to try a few more local butchers that I have been meaning to check out. Oh, and that top-down photo of the pasta, love it. I love carbonara, too. It’s too bad it’s not something we can enjoy everyday, right, because I definitely would! I know, too bad guanciale is not widely available. I will really look into making it myself. Thanks! I’m glad you like that photo. Playing with different settings around the house. Still working on the late afternoon-early evening lighting, though. Congrats! That must have been such a thrill! Thanks for sharing your post and our delicious pasta dish. congrats again! flying seems like it would be amazing, so consider me jealous! and this dish looks amazing–I didn’t realize people ate pigs cheeks, but uh, i can ignore the specificity of the meat if it tastes as good as it looks. And yes, pig cheeks are awesome! Yumm. I am so making this the next pasta night. And whoa, you can fly a plane???? wow, I would love to do that. When do you get your license? How exciting. And I love your photos, So crisp and vibrant! Lisa, I definitely CAN’T fly a plane yet. Just started to learn and it will be a long time before I get my license. I still have to study for the written and oral exams, fly solo, and get checked off by an instructor for the actual flight exam. Long way off! wow!! congratulations on the flight! i remember how happy and excited my father was when he first flew solo. and the pasta looks super tasty also!!!! Wowowow, how exciting to learn how to fly a plane! I don’t know if I would ever have the guts. Your pictures are outstanding. I love seeing Guanciale in your recipe, it is such a hard ingredient to find on menus. Did you happen go to last year’s foodbuzz dinner where there was brussels sprouts and guanciale? I actually used bacon since I didn’t have guanciale, but the latter is the best option for this dish. I would have loved to taste the guanciale with brussels sprouts, yum! Congratulations! i admire you for living your dreams… it may have taken you 20 years but what matters is you still fulfilled it. Not everyone could fly a plane, I could never imagine myself doing that… but whooa you’re one of a kind! A delicious rendition–and one of my favorite sauces, too! Congrats, thats great news, super exciting! Beautiful pasta dish daaaaaaahling. Looks so hearty and delicious. I have always been afraid of flying even today, flying long-distance several times a year; the only time I was not afraid was when i took a piloting lesson in a Cessna! I congratulate you and wish you to continue and get a commercial pilot license if that is your dream! I admire your courage and tenacity in following your dreams, and am in awe of your flying skills – I am terrified of small planes – although I’m sure its exhilarating! 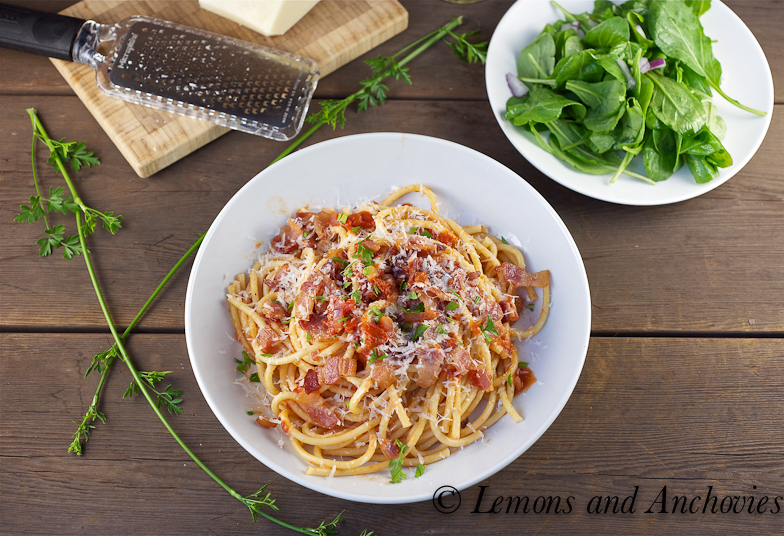 I’ll stick to the kitchen – love pancetta and your pasta dish is as beautiful as it is delicious, I’m sure! I just saw Guanciale on the menu at a pizza place this weekend–had no idea what it was (or how to pronounce it!) so I’m very pleased to find out! Thanks! We’ll see how far I get. If I get too scared, I may never get licensed but I have to try! Nothing wrong with rigatoni–my husband loves it, too. 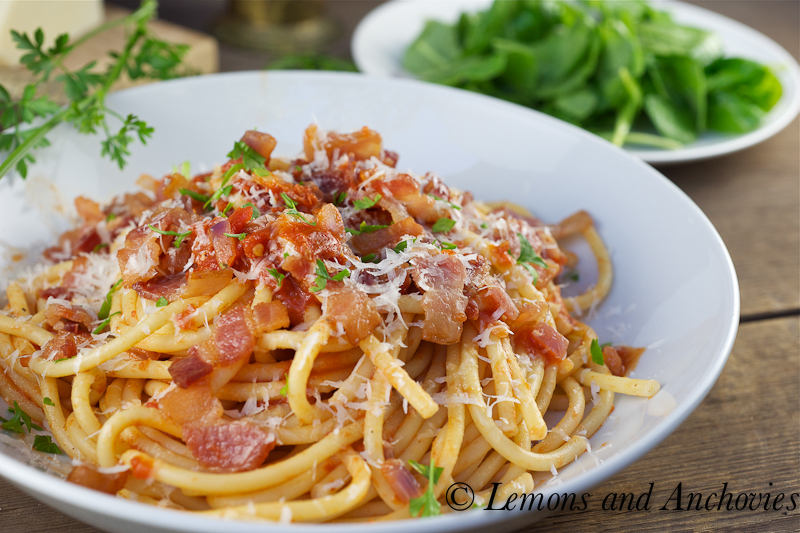 Oh, how I wish I actually had guanciale for this post! I’ll have to check out Judy Rodgers’ recipe. Thanks, Greg! What a phenomenal experience! I envy your courage and applaud your husband for supporting and pushing you when you need it. Keep up the fun work and keep the recipes coming too! Oh congratulations!!! I will live vicariously through you! My dad has a background in flying, his first solo flight was on a Cessna, and he met my mom through his best friend in flight school who was dating my aunt. Each couple married (is that confusing?). Anyway, my rambling aside, I’m proud of you for realizing this dream, it’s something I have always wanted to do. As for the pasta, oh delicious!!! Thanks, Liren. I hope I wasn’t too premature about announcing my first lesson–I was just so excited. I’m sure the challenges will grow from here but I’ll look to my husband for guidance, too. I agree with you on both the bucatini and chili flakes–they’re great! congratulation on your first step at becoming a pilot!!! now if your ever in a plane and the pilot gets sick when they come on the intercom asking if there are any pilots on board you can raise your hand!!! how cool will that be! Your pasta dish looks delicious too! Chef Dennis, you’re funny! 🙂 I’m only going for the private pilot license but I suppose if there was no one else qualified on the plane, I’d have to raise my hand! Haha! wow these pictures are gorgeous. 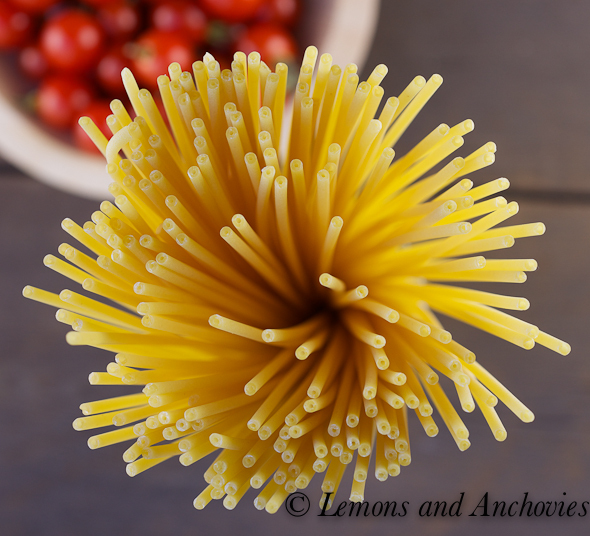 i really love the raw pasta pictures. and congrats on the piloting. As a kid i always wanted to be a fighter jet pilot! Thanks, Evan. My husband has always enjoyed helicopters, too. I think he really wants to learn how to fly one. Congratulations, Jean!! I am so excited for you… this is HUGE!!! So proud of you for finally taking the bold step to making your dream come true!! 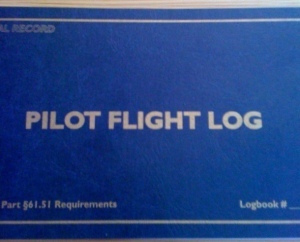 I hope you continue to log more hours on your new pilot flight logbook!! Thanks, Jun. I hope to log in more hours, too, but I have to admit it’s a little nerve wracking! Wow, sounds like a great adventure! The last photograph is absolutely gorgeous. Can’t stop looking at it. Such a pretty dish! Wow…you go girl! What a rush that must’ve been and so exhilarating. You have gumption, that’s for sure and I’m envious that you’re learning to fly! Congrats on your flight!!! It must have been so very exhilarating! Dishes like this make me really wonder about the taste of bacon (I don’t eat pork). 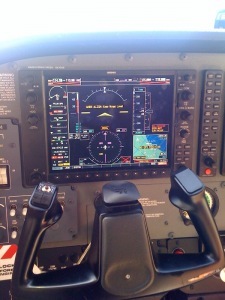 Wow – can I just say Congratulations for finally getting into the pilot’s seat!! Well done and so very inspiring… I don’t think I am going to fly a plane anytime soon but I might try to be a bit more daring from now on… Lovely pasta dish too – the addition of chili flakes is making my mouth water already. WOW .. i had no idea that your hubby is a pilot and that you learnt flying too. That much be the most amazing experience right 🙂 Congrats on your accomplishment sweetie and that pasta sounds lovely too! Congratulations! I can imagine how exciting to finally live your dream! Way to go, Jean! Thank you for this beautiful pasta dish! I didn’t know that you fly Jean. How exciting and so fulfilling for you! My dad was a pilot too. I thought of flying too, but there’s a height limit.